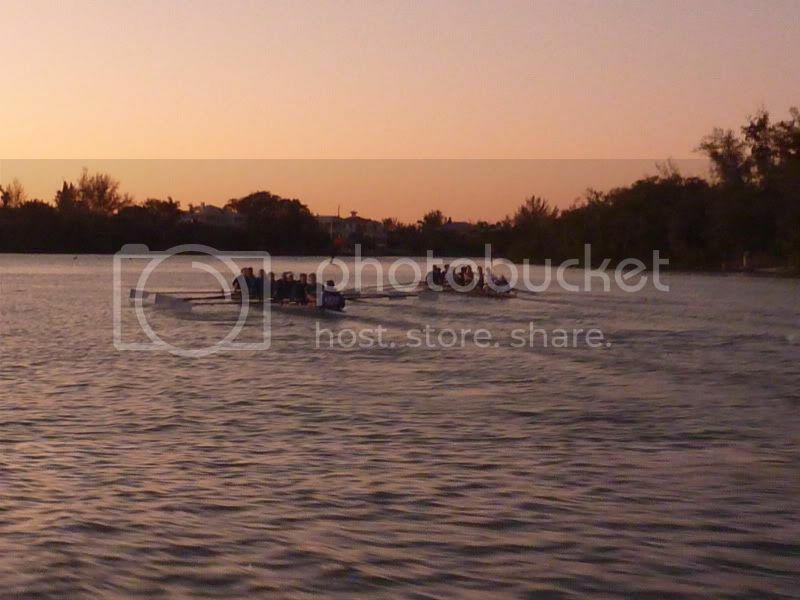 As I sit writing this blog, I feel as though I have spent the whole day rowing nonstop. All of the muscles in my body hurt and I am starving! We all began the day knowing that this morning’s practice would be a long one. After we had a nourishing breakfast provided by Diann Flanders, we got on the water. We rowed through the first bridge near our launch site and I took note of the channel marker 35. We did drills for the first half of the practice, making it past channel marker 1…a long way. All though the drills were very repetitive, they were effective because today I felt like I started rowing completely different than I had ever before. The biggest sign I felt was my muscles feeling more engaged at the catch. Probably why I am so sore right now. We took a 10 minute break, spun our boats and headed home. We dropped the drills and did steady state all the way back, making our way back each channel marker, one by one. After practice, Coach B stopped at the store to pick up ingredients for homemade meatballs, picking up at least 10 pounds of meat. We took over the varsity men’s suite and started adding ground beef, sausage, breadcrumbs, seasonings and too much cheese to measure. As Coach B perfected his tomato sauce, we rolled at least 50 meatballs. each big enough to feed a rower. As the small hotel room filled with the smells of Italia, leaving for our second practice at 3:30 was even harder. Holding true to our schedule back in Michigan, we still had our Wednesday test pieces. But luckily for us, the weather was nice and coach was in a good mood having seen Minnie the Moocher, so he allowed us to do the pieces on the water instead of the erg. In the eights, we did the pieces by 4’s, switching every 12 minutes, doing a total of 8 pieces. The pieces were hard, but I was happy to be on the water to try and perfect my new form of rowing. After three years, I would hope I would have it down by now. We started practice with the sun above our heads, and ended it well after the sun set. We returned to the hotel warm up and chow down on the meatballs that had been cooking all day, a hearty meal for a rower after a successful day of learning. Our trip winds down with one more day of practice but we have all done our best to make it worth it. The learning that had taken place is so valuable and I can not wait to get back on the water in Michigan and start racing. Today we woke up to freezing temperatures. Not something I expected to experience while in Florida. Along with the cold temperatures, were very nice water conditions. In the morning we spiced it up a bit with a longer row than normal, instead of doing stationary drills. It was definitely nice to work on technique while moving. We went farther than I’ve ever been, rowing past the channel that leads to open water. We also saw one of the live team mascots, Minnie the Moocher, which breached a few times for the boats. 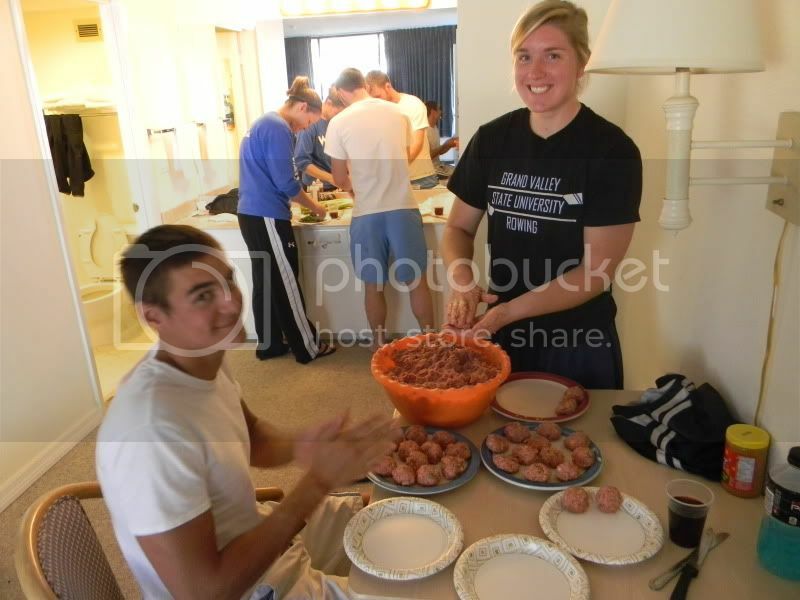 In between practices coach taught a few rowers how to make real Italian meatballs. Cutting carrots and celery with butter knives was interesting, but with all of the volunteers we got them cooking in less than an hour. Given the fact that we made somewhere around one hundred meatballs, I’d say that’s pretty good. 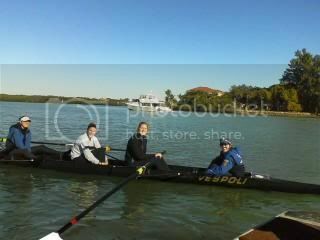 For our afternoon practice, coach treated us to having our Wednesday workout on the water instead of on the erg. Even though we went pretty far this morning, we went even farther during our pieces. We did 4x12’ in the 8s by 4s. Coach B’s kids, Pat and Salvatore, got in the men’s boat for a few of the pieces each. Coming back to the smell of an Italian restaurant in my room was well worth the workout. I’d say everyone on the team had a great workout and are excited to go back tomorrow. 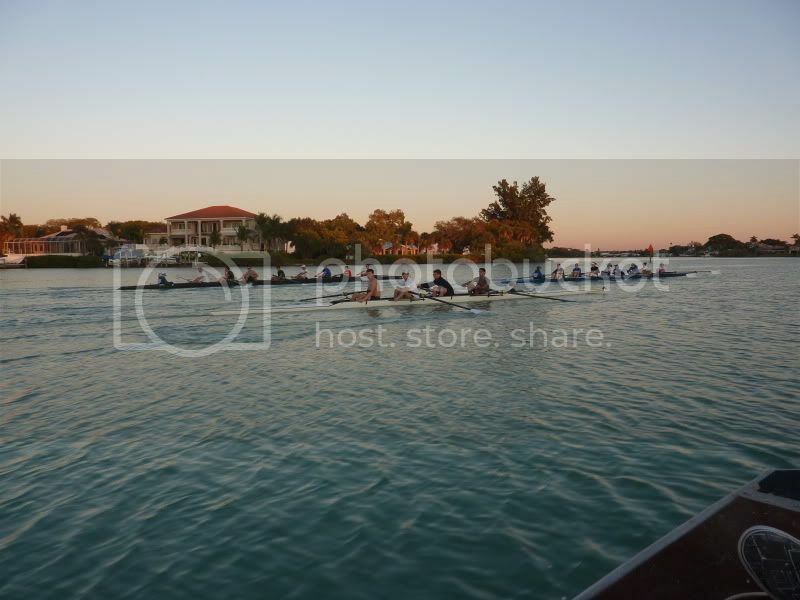 Today we started off the day again at 7:30 A.M. , meeting at the Sarasota Crew boathouse. We almost felt at home because it was 35 degrees! Hello long spandex and multiple layers! I have the privilege of staying with Chuck, Diann Flanders and their daughter Kate and they graciously provided breakfast for the team this morning. Even though it was a little chilly, we were happy to munch on bagels, apples and other “rower-approved” food! 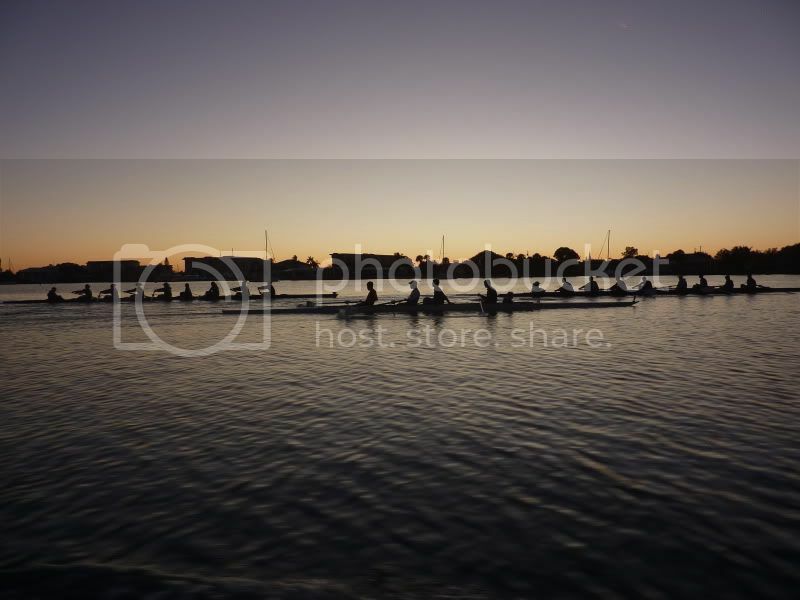 The water was beautiful this morning and we were able to have a long steady state row. I worked with Coach Lisa and we spent half the practice working on exercises to help improve our recovery- some progressive pause drills and ‘cutting the cake’ drill. The second half of practice was spent on the drive- working with the top 6 inches, legs and back only. After practice, we were excited to hear that our erg pieces were now going to be done on the water! There were sighs of relief and cheers all around. Later on in the day when we returned to the boathouse, we launched and started our 12 minute pieces. After 2 pieces, we had to turn around as it was getting dark. This started what was approximately a 1 hour and 15 minute row back to the boathouse. Even though we were all exhausted and our muscles ached, the girls in my boat took turns cheering each other on and supporting them each stroke. It makes me feel so much closer to my teammates when everyone is in pain, but we still muster out the words to push each other until the last stroke. It makes me very proud to be a part of this team and I’m honored to pull with these girls in the Laker Navy. It has been a great week here, even though we had our ups and downs, Grand Valley Rowing has pulled together once again to create a great trip full of memories, laughs and bonding. Today began at 7:30 when we headed to our first practice. When we got to the course, breakfast was waiting for us in the form of bagels with cream cheese, fruit, and various drinks. After eating, we headed out onto the water. At first it was cold, and we set off layered up. By the end of the first hour or so, the sun was up and it quickly grew warmer. 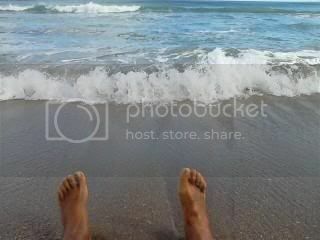 My boat rowed down past the entrance to the Gulf of Mexico before spinning and heading back. We did lots of drills, such as swing pick and straight arm rowing on the way out and mainly steady state on the way back. Overall, we were on the water for about three hours. After practice, coach gave us the good news that due to the lovely weather, rather than doing our pieces on the erg that afternoon, we would instead do them on the water. Yes, we cheered. After a brief afternoon rest, we headed back to the course for our second workout. We did eight pieces that were each twelve minutes long, only rowing four at a time. My boat ended up rowing by sixes for most of the pieces in order to keep up with the men’s boat. We were out well past dark, and rowed back under the stars in the moonlight. By this point, it was significantly colder, and at the end of our second three hour workout of the day, the only things we wanted were a hot shower, Coach B’s homemade meatballs, and a warm bed. Hometown: Delia, Sicly and Atlantic City, New Jersey. There is a lot to report on this trip. Technically we are working on the same things when I fist started coaching, only now we have been able to refine and develop a great approach in producing technically competent rowers. Enough about rowing, the Alumni kicked in some great stuff. The Manatee County people/workers have been very supportive and have been a great help. The Palmetto High School coaches are great and make me want to come back every month. Well to tell you the truth it is really the weather at this time of the year but don’t tell Coachs Trish and John. On to the great stuff, I assigned myself the duty to travel to Tampa International Airport to pick up Costas Ciungan ’14. On my way there and as I was driving along the Sunshine Skyway, there was something to my port side; I mean left side of my car. I saw the most beautiful sunset. Was it an omen or was it a beautiful sunset? Ahh who cares, after a few down the past weeks that sunset told me everything was going to be fine. I was early at the airport and I pulled into the cell phone waiting lot. This was the Taj Mahal of cell phone lots. New pavement, an gigantic tote board for arriving flights, and a suggestion that you do not leave the lot until 25 minutes after the arrival of your party. It had fantastic bath rooms, vending machines, and do you believe this: wireless internet. Enjoying the time with my boys, coaching my team, and seeing how dark I can get in ten days. Three Questions from the editor. 1. What was the first day like back on the water coach? 2. Who do you think will make the varsity boat? Well I was thinking from bow to stern it would be Dancer, Prancer, Vixen, Comet, Cupid, Donner, Blitzen, and stroke will be Rudolf. If Dasher improves her technique at winter training camp then Dasher will be in the Varsity boat. 3. Will Minnie the Moocher be back from last Years Winter Training camp? Well I can’t be certain, it all depends on the speed of the boat and the development of Touch. Minnie Loves fast boats, especially fast NEW boats. Typical Woman. The Women’s and select Men’s Team athletes are currently training in Sunny Florida. On behalf of the entire team, we would like to wish everyone a Happy New Year and invite you all to follow the Athlete’s and Coaches’ Daily Blogs, the links to which can be found below. They are looking forward to a fun and productive week of rowing and sightseeing in the Sunshine State! It is currently 4:30pm and I am sitting on my couch with a smile on my face. This smile is here for a nubmer of reasons. The first is that my two kittens, Marlow and Roger whom I haven’t seen in over a week, are snuggled next to me trying to get inches closer with every breath and purr. It is evident that my presence has been lacking in this two bedroom apartment. Secondly, I was fortunate enough to board an airplane and fly home from Florida. A two-and-a-half hour plane ride sure beats being crammed in a 15-passanger van for give or take 27 hours, but someone had to do it. The ride was smooth and I had the pleasure of traveling with Jordan Hart, a fellow varsity coxswain and very good frien, and also the Bancheri boys, Salvatore and Patrick. All three were delightful companions and made the trip more than enjoyable. The last reason I have a smile on my face is because as I was reflecting on the techinical vacation from which I have safely returned, I am thinking about all that has been accomplished as a team, by boats, and individually. Rowing is a unique sport because it defines the word: TEAM. Rowing is not a sport that can be done alone- even if you are in a single. Between the equipment, the coaching, the coxswains, the other athletes, it is obvious this is not a one man (or woman) production. The next step in the intricate operation is time management. A boat cannot take thirty-five minutes to get rigged if there are fifteen other boats on the trailer that have to be put together and practice starts in an hour. If done properly, the sport of rowing should look like a well rehearsed and synchronized dance. Coxswains gathering hands on the trailer and on boats and taking them to waiting slings and athletes waiting to construct the stage in which the perform. Meanwhile tee’s are being brought to the launching site as well as oars and tool boxes. And somehow, no matter how many people are moving about, we get it done. By the last day, the freshamn and novice knew exactly what needed to be done often times before I asked for it to be done. They had practiced their dance, and they were getting top marks from me for their performance. This week I mostly worked with the first women’s varsity eights and an eight of select men. The women’s boat was an older group, consisting mostly of juniors and seniors while the men’s boat was younger regarding their experience level. We have been off te water since the week before Thanksgiving break, so it was nice for all of us to get back into a boat. We were all a little rusty, and it wasn’t from the salt water. Coach B had everyone start back at square one. This was an important tactict because we can’t make national champions with out engraining the fundementals our heads. The first four days we barely took full strokes. I had my crews focusing on the five principals of any sport: timing, balance, control, posture, and touch, until they got it right. And by right, I mean perfect. For some of the upper classmen it felt monotenous and boring at times, but they still found places they were lacking and brought those elements back up to par. I was so thrilled with the amount dedication and focus to the details. I was able to see with my own eyes girls who are seniors like me, excel beyond what they have done the past three years. As for myself, I am proud. I can say now, that after almost four years of rowing, it is a passion. It is hard not to live, eat, breath rowing, especially on this team-being as competitive as we are. On this trip, I also perected my skills, starting with the bascis. On the first day, I focused on what I was saying to the rowers. I concentrated on being clear in my commands and my explanations of drills. The second day I continued to work on my commands, but I also practiced finding imperfections in each persons stroke and helping them improve. It allowed me to gain confidence in that person because they knew I was doing my job as a coxswain as well as teaching me to use different techiniques and methods to help them. These techniques ranged from simplifiying the stroke with my words, standing up in the boat and demonstrating the exact motion I was looking for, or putting them on an erg and personally contorting their bodies so they could feel what I was looking for. The days following, I worked on my steering and my communication with Jordan in the other boat. Steering is the number one ability a good coxswain needs to succeed. I know the rowers want to go fast and so do I so I am going to to everything in my power to make that happen. On a more personal level, I am proud that I have made it to my fourth year on the Laker Navy. Between school, rowing, and a part-time job, I have been able to make the Dean’s List every semester, produce the first ever senior citizen LipDub ( http://www.youtube.com/watch?v=uZ7-n930zJo -I had to put in the plug!! ), and graduate in four years. However, I am CERTAIN that without rowing, none of this would have happened. I am so thankful I was able to be on this trip. Thank you to everyone who made it possibile, not only for me, but for the team as a whole.